Fresh! 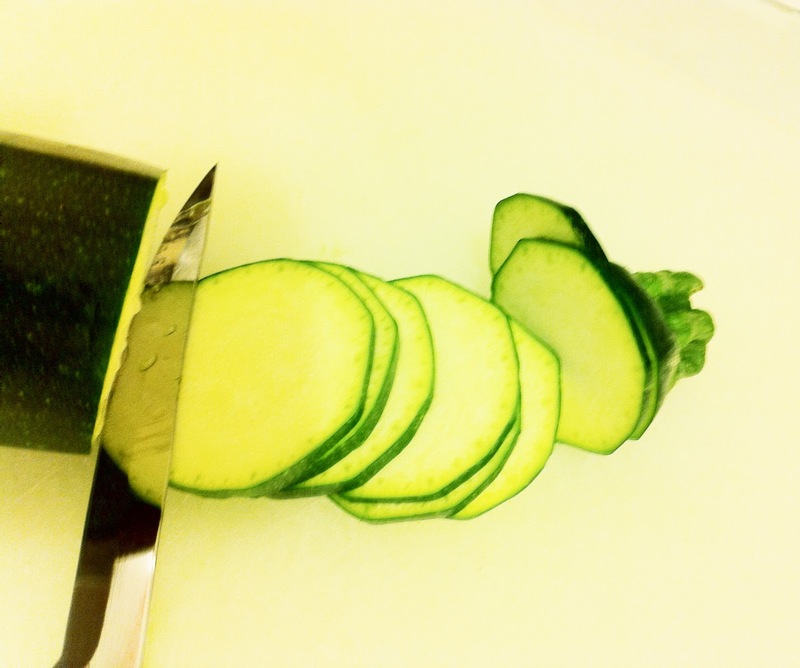 Fresh zucchini is the key that won the hearts of my guests last Tuesday. 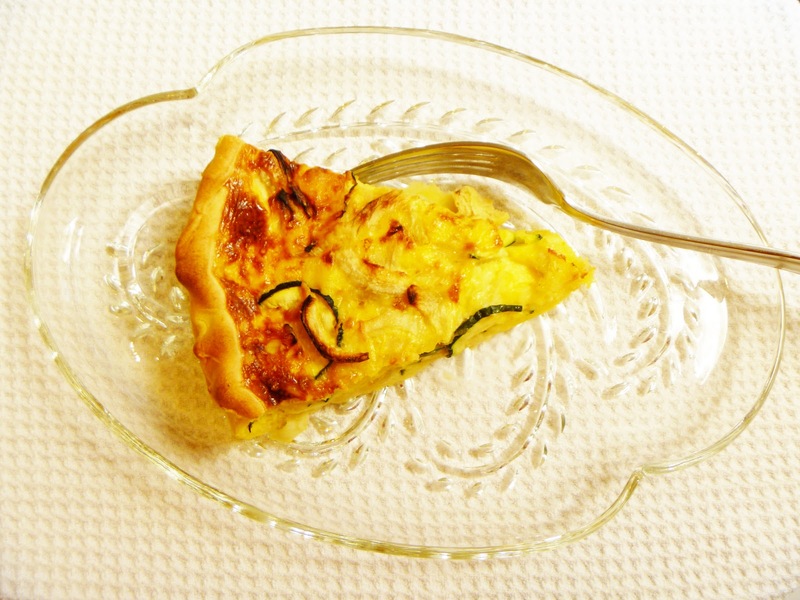 You can make a quiche with just about anything, but if you start with a succulent melt-in-your mouth zucchini – you get a succulent melt-in-your mouth quiche. Quality ingredients make all the difference! The best zucchinis are the young ones, so look for the smallest one in the garden, market, or grocery – about 5 inches (12cm) long with a diameter of about 1 inch (3cm). Babies like this are sweet and tender, and don’t have mature seeds so the flesh is smooth and juicy. 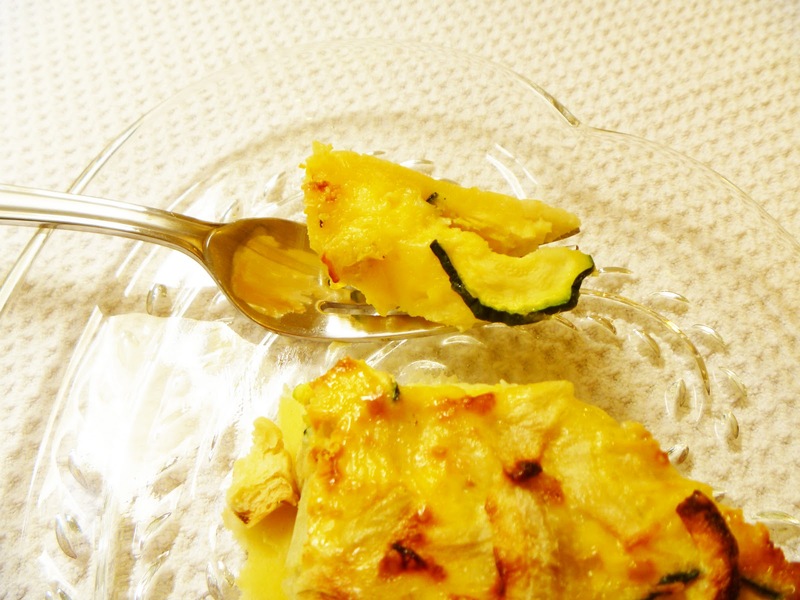 The skin on my baby zucs was so tender and not bitter at all, so I was able to slice it as is and keep the skin to add a little color to my quiche. Preheat your oven to 365°F (200°C). Start with one flat bottomed quiche or tart pan (you can substitue a 9 in round cake pan, but you won’t get the best results with a pie pan). 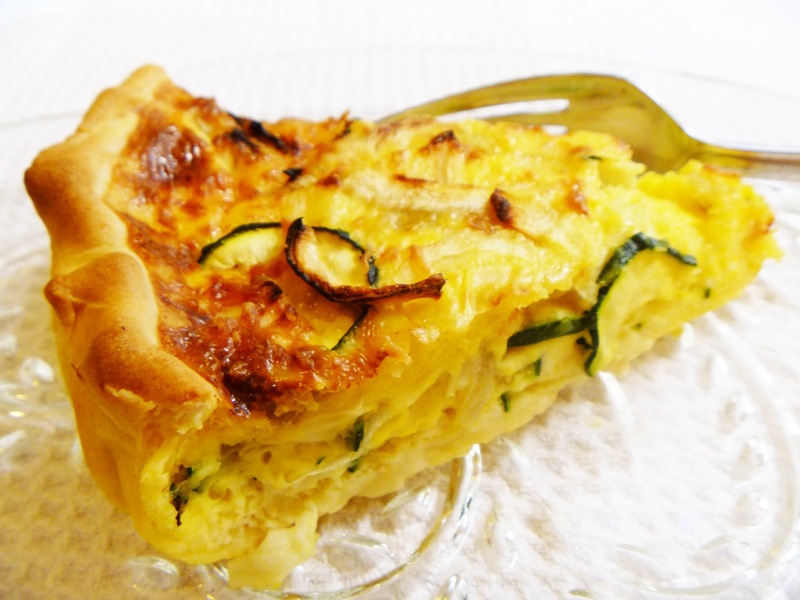 Cover your quiche / tarte pan with parchment paper. Lay out the ready-made pie crust on top of the parchment paper. In the unbaked crust toss your solid ingredients. In this case : Two baby zucchinis, a diced white onion, and two large handfuls of shredded cheese. Then whisk your quiche mixture and pour it over the solid ingredients and pop it into the oven on the middle rack. Remove it from the oven when it’s golden on top and solid in the middle. Adapt this recipe for your next party or open-house by cutting the quiche into bit-sized cubes and serving on a tray with toothpicks! Or go all the way and make mini-quiches for a starter course at your next dinner party.